Micky Allan’s socially aware photographic practice arose from the feminist and collectivist strategies of the 1970s, which turned towards photography as the most appropriate way of documenting people’s lives and experiences. Born in Melbourne and educated in Japan, Melbourne and Kansas, Allan trained as a painter at the National Gallery Art School, Melbourne (Victorian College of Arts). She started taking photographs in 1974 after joining a loosely formed feminist collective at Melbourne’s Pram Factory, a progressively experimental arts and theatre space. Allan’s background as a painter led her to the unconventional practice of hand-painting her photographs, which personalised her work and undercut photography’s claim to mechanically and objectively record reality. The hand-coloured portraits of her series ‘Babies’ 1976, ‘Old Age’ 1978 (AGNSW collection) and ‘Prime of Life’ 1979 are sensitive and emotive works which trace the passage of life and the ever-changing human condition. 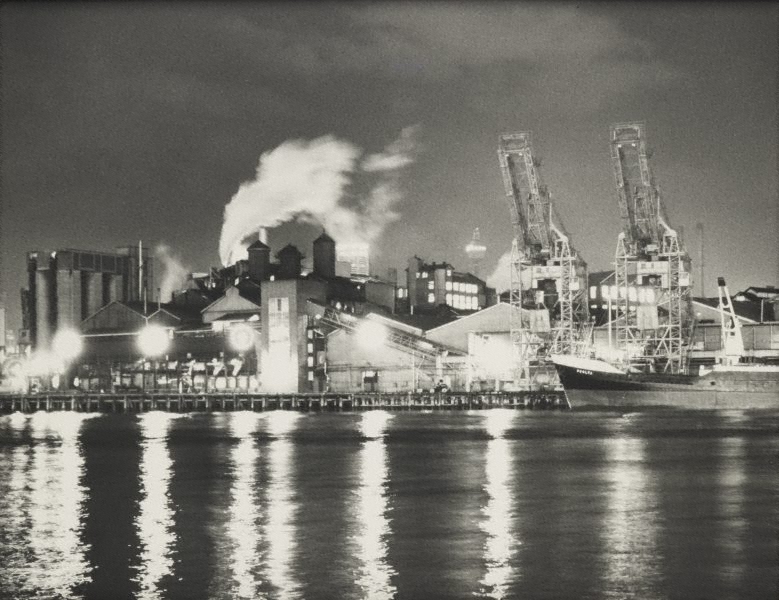 Her perceptive documentation of people and of the social condition is also evident in her urban studies of the CSR sugar refinery in Pyrmont, Sydney. The diptych ‘The factory’ was taken as part of the 1978 CSR Photography Project for the Pyrmont Refinery Centenary, commissioned by Christine Godden of the Australian Centre for Photography. Allan, along with five other photographers, documented the working life of the factory and its defining presence on the harbour in a series of images. The majority of Allan’s photographs were taken inside the factory, and evoke its industrial atmosphere through a dark, grainy look which emphasised imperfections in the print. 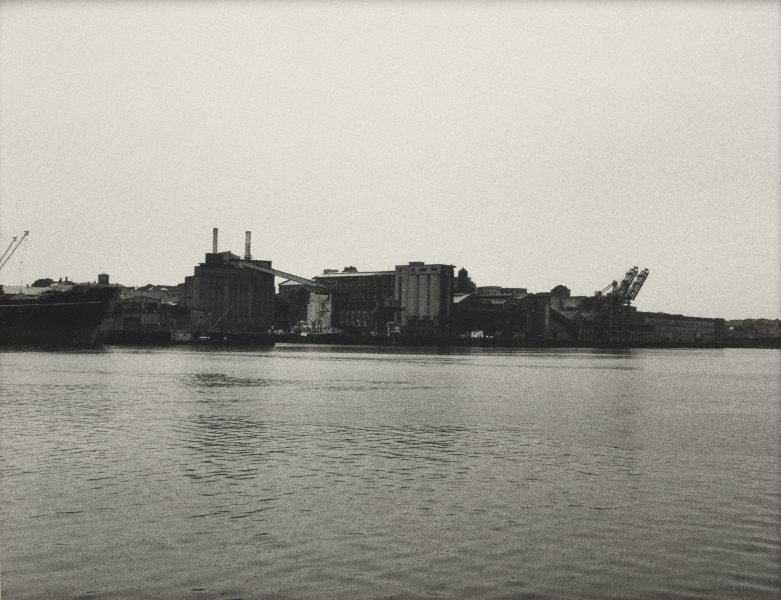 This diptych of distant views treats the factory as a composition of forms dominating the landscape. Yet, as with her sensitive portraits, Allan’s studies of the factory also suggest its personality and its inner working life: a quiet yet hulking presence by day which comes alive at night as the city sleeps. Allan ceased photographing in 1983 to concentrate on painting. Signed and dated l.l. sheet [a-b], pencil "M Allan 1978". Bronwyn Clark-Coolee, Photography: Art Gallery of New South Wales Collection , 'Not 'simply' anything', pg.266-287, Sydney, 2007, 279 (illus.). What is this thing called photography? Australian photography 1975-1985 , Annandale, 2000, 31 (illus. ).